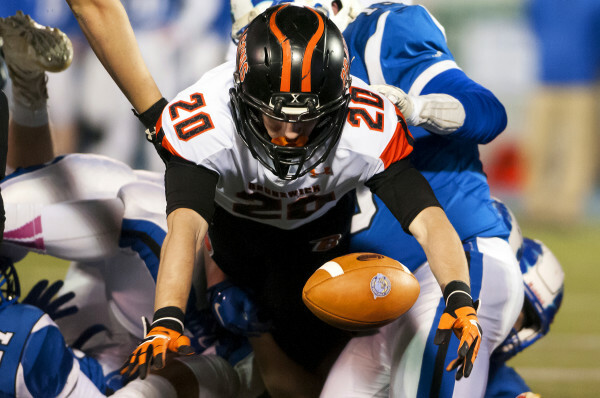 Brunswick's Hunter Garrett dives after a fumbled ball after getting hit by a Kennebunk player during their Class B football state championship game on Friday at Alfond Stadium at the University of Maine in Orono. 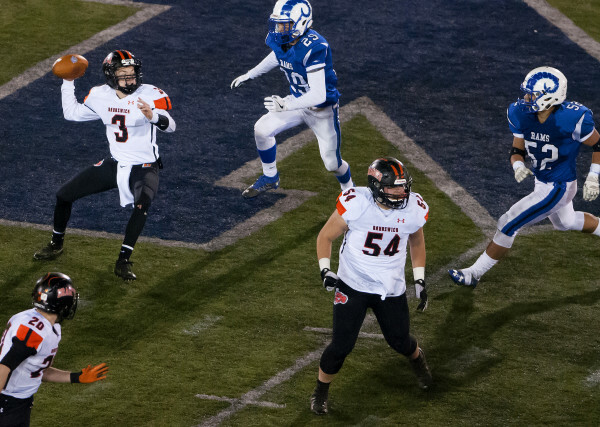 Brunswick's Jesse Devereaux (right) looks to run up field past Kennebunk during their Class B football state championship game on Friday at Alfond Stadium at the University of Maine in Orono. 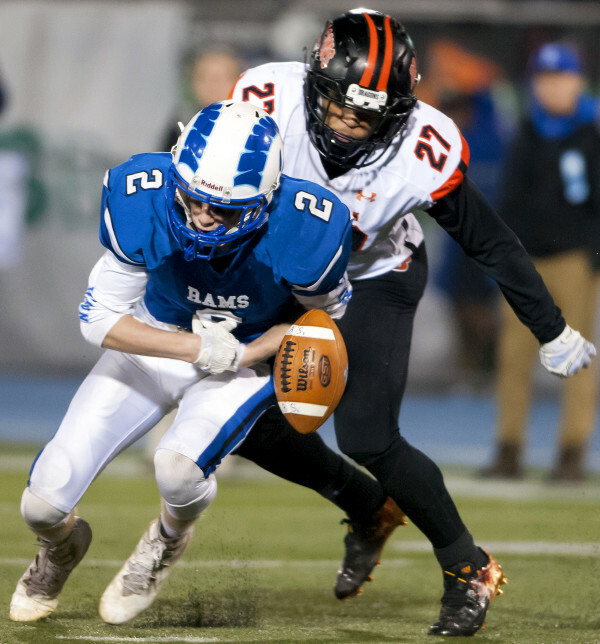 Brunswick's Ben Palizay (center) tries to avoid a tackle from Kennebunk's Nolan Ragnarsson (right) during their Class B football state championship game on Friday at Alfond Stadium at the University of Maine in Orono. 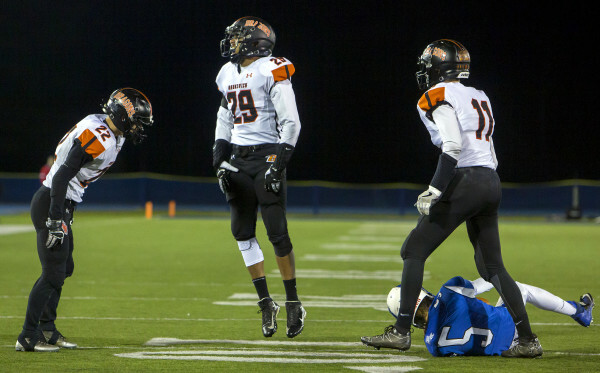 Brunswick's Ben Palizay (center) is brought down by Kennebunk's Zachary Sullivan (left) and Garrett Philbrick during their Class B football state championship game on Friday at Alfond Stadium at the University of Maine in Orono. Kennebunk's Zachary Sullivan (left) misses a pass intended for him while Brunswick's Ben Palizay keeps the pressure during their Class B football state championship game on Friday at Alfond Stadium at the University of Maine in Orono. 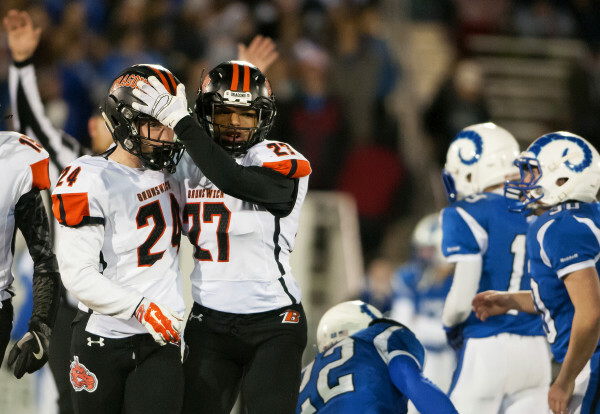 Brunswick's Ben Palizay (center) celebrates with teammate Alex Demars after scoring a touchdown against Kennebunk during their Class B football state championship game on Friday at Alfond Stadium at the University of Maine in Orono. 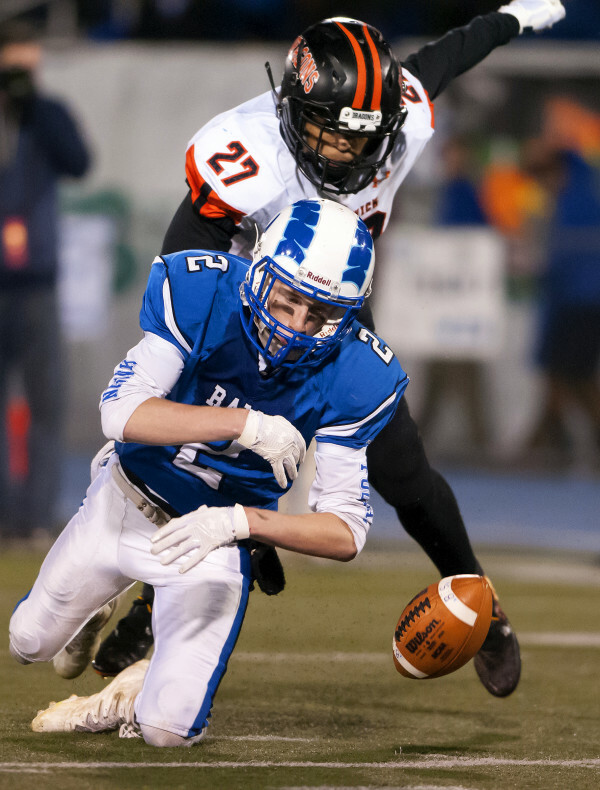 Brunswick's Jaznel Burns (right) sacks Kennebunk's Joseph Bush Jr. during their Class B football state championship game on Friday at Alfond Stadium at the University of Maine in Orono. Kennebunk's Patrick Saunders stumbles into the end zone for a touchdown against Brunswick during their Class B football state championship game on Friday at Alfond Stadium at the University of Maine in Orono. 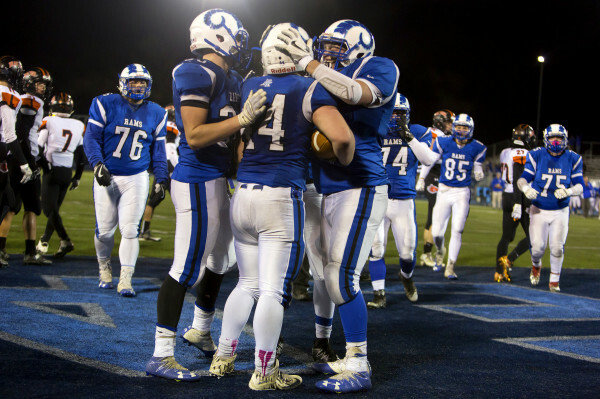 Kennebunk's Patrick Saunders (center) celebrates with teammates after scoring a touchdown against Brunswick during their Class B football state championship game on Friday at Alfond Stadium at the University of Maine in Orono. 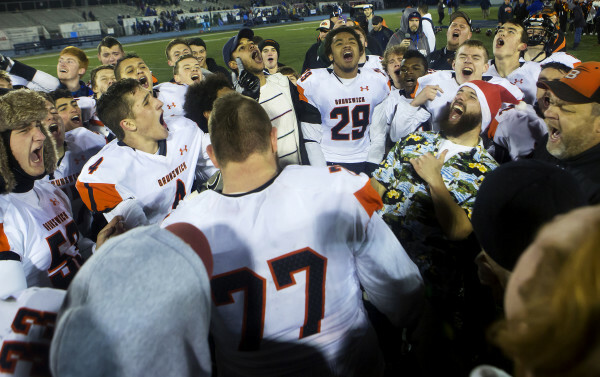 Brunswick's Jaznel Burns (center) celebrates after taking down Kennebunk's Joseph Bush Jr. during their Class B football state championship game on Friday at Alfond Stadium at the University of Maine in Orono. Brunswick's Christian Jensen (left) looks to throw up field past Kennebunk during their Class B football state championship game on Friday at Alfond Stadium at the University of Maine in Orono. Kennebunk's Joseph Bush Jr. (right) looks to throw up field past Brunswick during their Class B football state championship game on Friday at Alfond Stadium at the University of Maine in Orono. 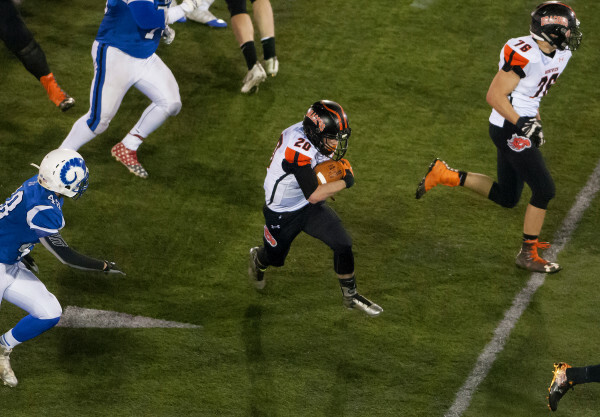 Brunswick's Hunter Garrett (center) runs up field past Kennebunk during their Class B football state championship game on Friday at Alfond Stadium at the University of Maine in Orono. 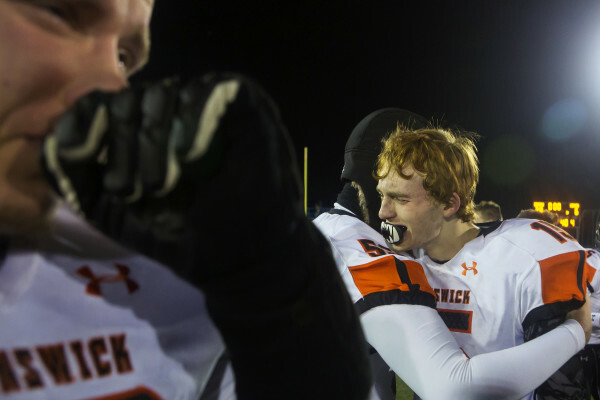 Brunswick's Hunter Garrett (center) sheds tears of joy as time expires for his team to defeat Kennebunk during their Class B football state championship game on Friday at Alfond Stadium at the University of Maine in Orono. 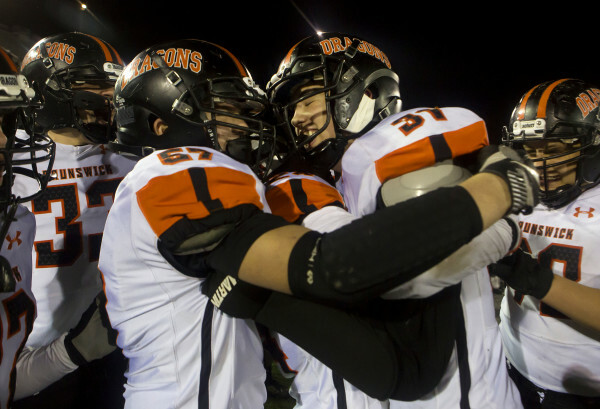 Brunswick's Hunter Garrett (left) embraces teammate Austin Philips as time expires for their team to defeat Kennebunk during their Class B football state championship game on Friday at Alfond Stadium at the University of Maine in Orono. 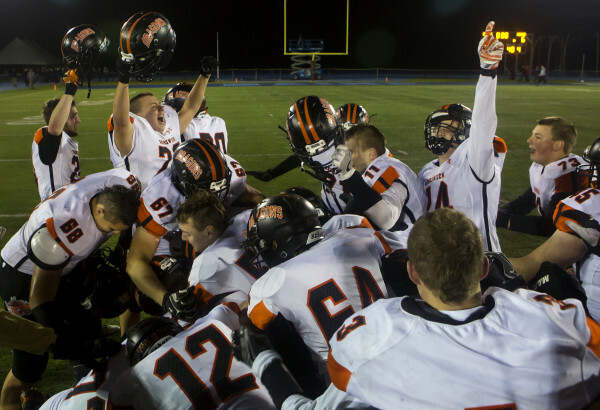 Brunswick celebrates after defeating Kennebunk during their Class B football state championship game on Friday at Alfond Stadium at the University of Maine in Orono. 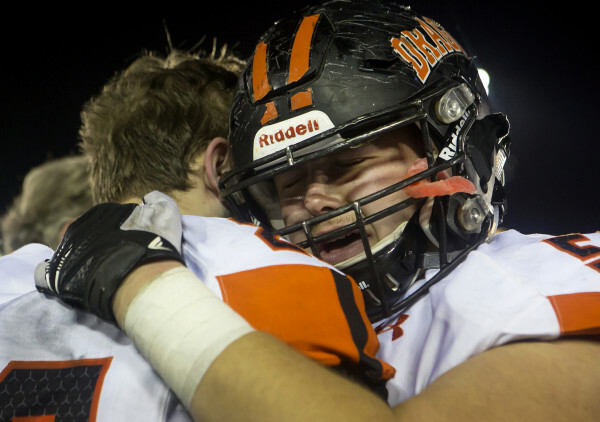 Brunswick's Aaron Gary (right) embraces his teammate after defeating Kennebunk during their Class B football state championship game on Friday at Alfond Stadium at the University of Maine in Orono. 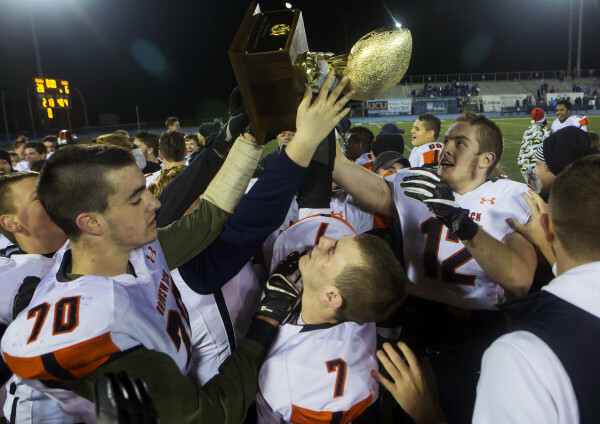 Brunswick's Jackson Gordon (left) kisses the golden ball after defeating Kennebunk during their Class B football state championship game on Friday at Alfond Stadium at the University of Maine in Orono. 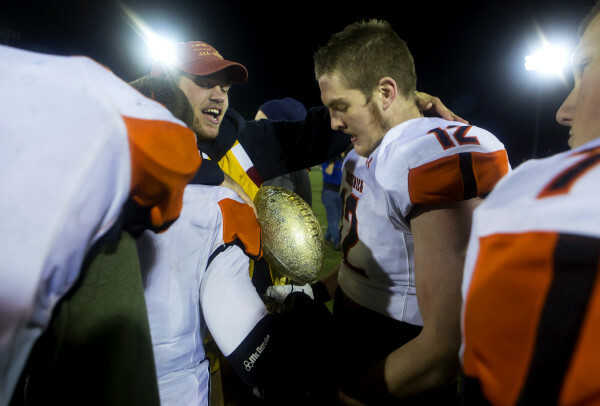 Brunswick's Corban Teel (right) looks at the golden ball after his team defeated Kennebunk during their Class B football state championship game on Friday at Alfond Stadium at the University of Maine in Orono. 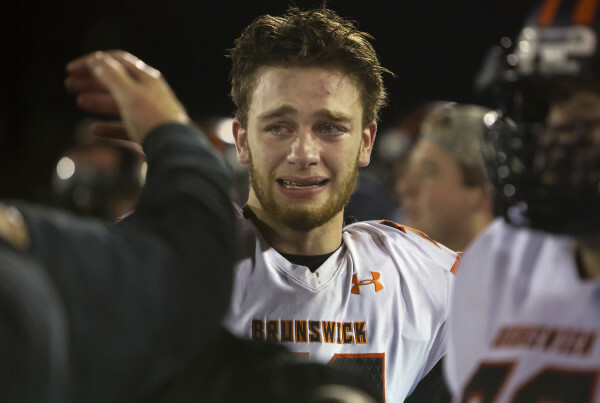 ORONO, Maine — Typically, when a team commits five turnovers in a championship game, disaster is inevitable. 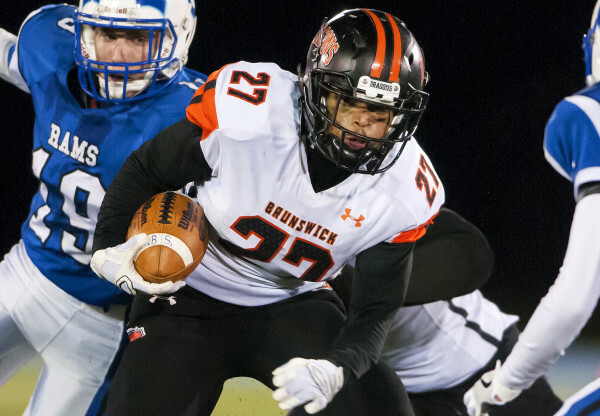 But often, the best way to avoid such perils is with a great defense, and that was a trait the Brunswick football team showcased in ending a five-decade state championship drought Friday night. 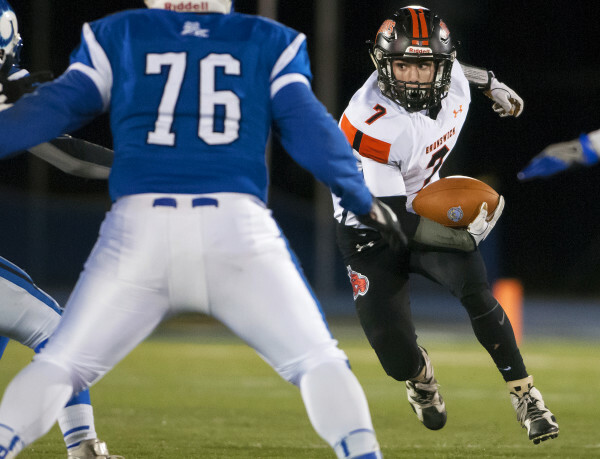 Senior tailback Ben Palizay also rushed for two touchdowns — setting one up by returning the opening kickoff 70 yards — as the Dragons annexed their first state championship since 1963 with a 28-6 Class B victory over Kennebunk at the University of Maine’s Alfond Stadium. 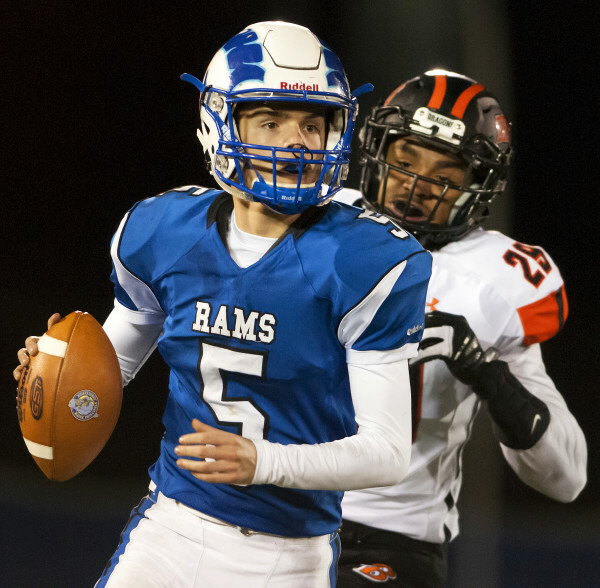 Coach Dan Cooper’s team capped off an undefeated season (11-0), and the Rams finished 10-1. In 1963, Brunswick shared the state championship with Madison. Kennebunk was seeking its first state title since 1991. The Dragons struck just a minute, 13 seconds into the contest, with Palizay’s kickoff return setting Brunswick up at the Kennebunk 15. 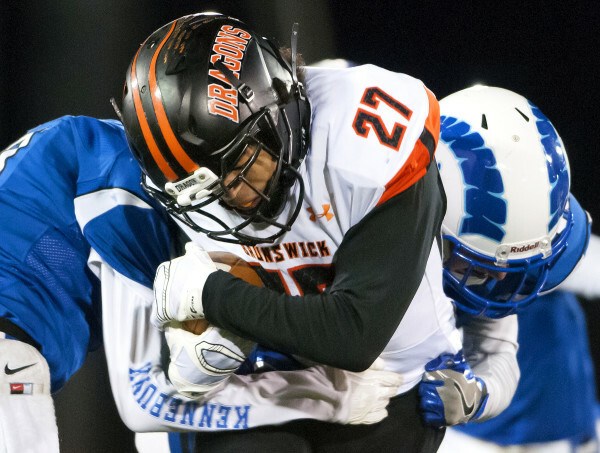 It took just four plays for Brunswick to find paydirt, with Palizay finishing the short drive with a 2-yard burst up the middle and into the end zone. Hunter Garrett’s two-point conversion rush made it 8-0. Palizay was able to field the line-drive kickoff, and a perfect blocking scheme allowed him to find a huge gap up the middle before he cut down the right sideline before being forced out of bounds. “Just great blocking and I was able to hit the hole and go 70 yards and set up our offense,” said Palizay, who rushed for 45 yards. Neither team was able to generate much of anything offensively for the rest of the opening quarter, and Brunswick’s quick defensive front was able to hold Kennebunk without a first down over the first 12 minutes. Late in the first, Brunswick took over at the Kennebunk 38 after a punt, and six plays later, Garrett was able to get into the end zone from 4 yards out. The score was set up by a 31-yard pass play from Christian Jensen to Garrett on a 3rd-and-10. Jensen’s two-point conversion pass to Jackson Gordon made it 16-0. With eight minutes left in the opening half, Kennebunk was able to finally catch a break, with Christian Putnam recovering a Dragons’ fumble at the Brunswick 17. Patrick Saunders got the Rams on the board five plays later with a 1-yard plunge, but the two-point conversion rush was no good. 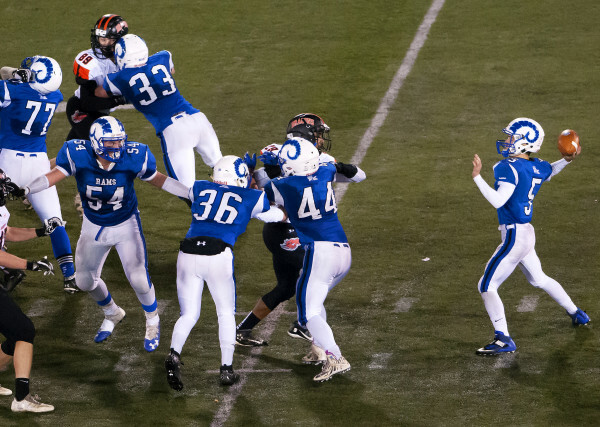 Palizay would again set the Dragons up in great field position on the ensuing kickoff, returning it to the Rams’ 44. It would take Brunswick nine plays to find the end zone again, this time on a quarterback sneak by Jensen from a yard out. 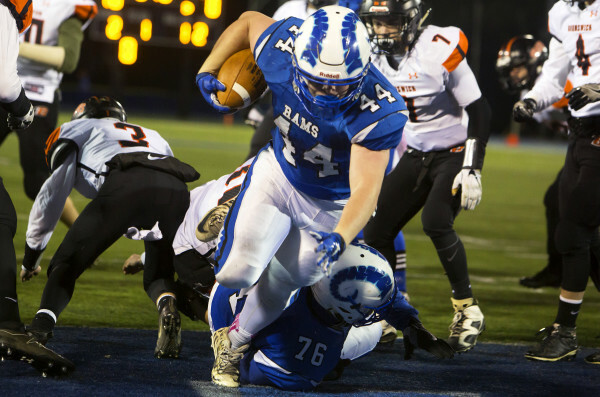 The Dragons had been faced with a 4th and 3 at the Rams’ 5, but Kennebunk jumped offsides, and Brunswick was able to pick up the first down on a 2-yard run by Jensen. The second half was marred by turnovers, but Brunswick was able to keep Kennebunk at bay thanks to its defense in spite of four second-half giveaways. The Rams were unable to move the ball with any consistency, mainly thanks to the Dragons’ speed off the edges. Brunswick put the game away with 3:06 remaining on Palizay’s second touchdown of the night, this one coming from 3 yards out. Cooper then breathed a subsequent sigh of relief on the sideline. “I was a little nervous because we had a hard time moving the ball,” Cooper said. Kennebunk turned the ball over on downs in Brunswick territory on three occasions in the second half and could not get inside the Dragons’ 30. Jacob Littlefield paced Kennebunk’s ground attack with 58 yards on 14 carries. Follow Ryan McLaughlin on Twitter at @rmclaughlin23.